When it comes to homemade Indian dinners I’m never content with just one dish. Usually I’ll spend a whole afternoon preparing an Indian feast, using every pot and pan in the kitchen (knowing my husband will happily wash up in return for a hearty meal). Until recently these feasts typically comprised a hero meat dish complimented by a vegetarian curry, dhal or dhokla. But, since limiting my meat consumption to once weekly my Indian cooking is 100% vegetarian. As a result I’m hugely appreciating why so many people in India don’t eat meat. That’s because Indian cooking turns ordinary vegetables into extraordinary creations. 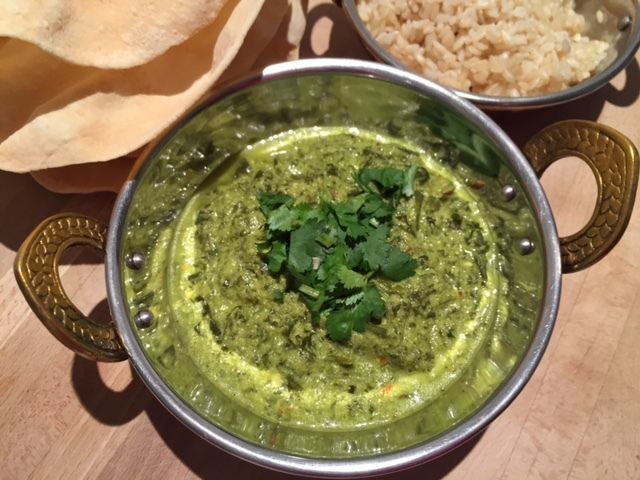 Take this curry for example – it transforms spinach into a mouth-watering spice infused creamy gravy. This recipe is easy and quick to prepare, is packed full of greens and is high in protein thanks to the cheese. It comes from Rick Steins India cookbook. There he calls it sag paneer, and it’s similar to the popular palak paneer. Sag is the broad name for a variety of leaf based greens and palak is the Hindi word for spinach. Both dishes have a spice infused green gravy and are dotted with cubes of paneer cheese. But instead of cubes of paneer I prefer to mix through creamy quark – this brings the spinach and cheese together with an even consistency. That’s why I’ve called my dish Spinach/Palak quark curry. It’s delicious paired with roti, naan or rice, or alongside a whole roasted cauliflower. Before I dive into the ingredients I wanted to share a couple of tips for this recipe (they apply to many Indian curries). First blend the garlic, ginger and onion base into a paste and cook it in coconut oil or ghee to start the curry. This paste method produces more flavour than cooking finely chopped onion, garlic and ginger. Second make your own garam masala instead of buying it from a store. Garam masala is a spice blend that brings flavour, aroma and warmth to Indian food. It’s easy to make at home with basic Indian spices and keeps fresh for a month. You can see how to make it here. Blend the onion, ginger and garlic in a hand blender until you have a smooth paste. Heat the oil in a large saucepan and once hot add the paste. Cook for a 4-5 minutes. Add the chilli powder, turmeric and garam masala and cook for another couple of minutes. Add the roughly chopped spinach to the pan, cover and allow to wilt for a few minutes. Turn off the heat and gently blitz the spinach into a rough pesto like consistency (with a hand blender). Stir through the salt and quark and cook for 5-10 minutes on a low heat. Add a splash of water to loosen as needed. 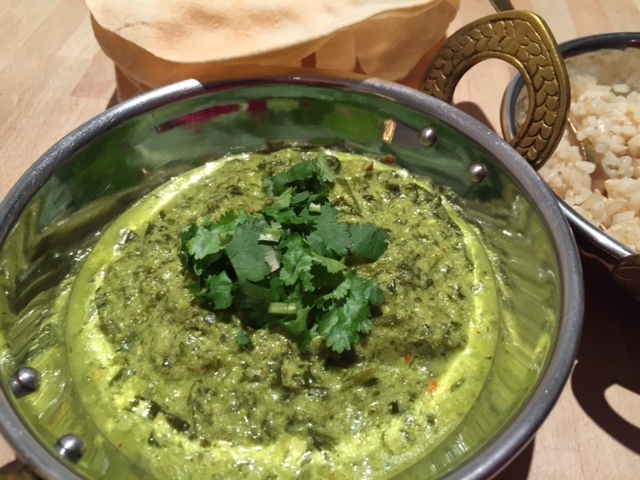 I’d love to hear – what’s your top Indian vegetarian curry? Tags: curry, palak, paneer, quark, sag, spinach. Bookmark the permalink. I love palak paneer! have never tried making it though. The ingredients are a lot simpler/common than I would have thought! 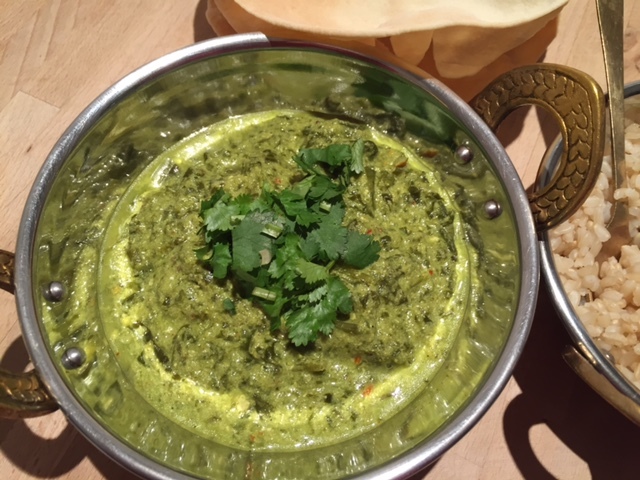 Thanks Zoya – glad you like the recipe – and yes if you like palak paneer you should give this a go, its very easy!